Spring is here! The sun is out, the birds are chirping, and the smell of flowers is in the air. Which means it’s time to clean up your Google Analytics account. That’s right. It’s time for a Google Analytics spring cleaning. With or without GDPR on your mind, there’s no better time than now to remove old, unnecessary data from your Google Analytics account. I just performed my own Google Analytics spring cleaning, and it felt amazing! I deleted dormant web properties, and I purged data I’ll never use. Today, I’ll walk you through the steps I took to clean up my Google Analytics accounts. Follow along, and you can learn how to do a proper Google Analytics spring cleaning. Before we get into cleaning up our Google Analytics accounts, I want to offer a quick update on data retention. 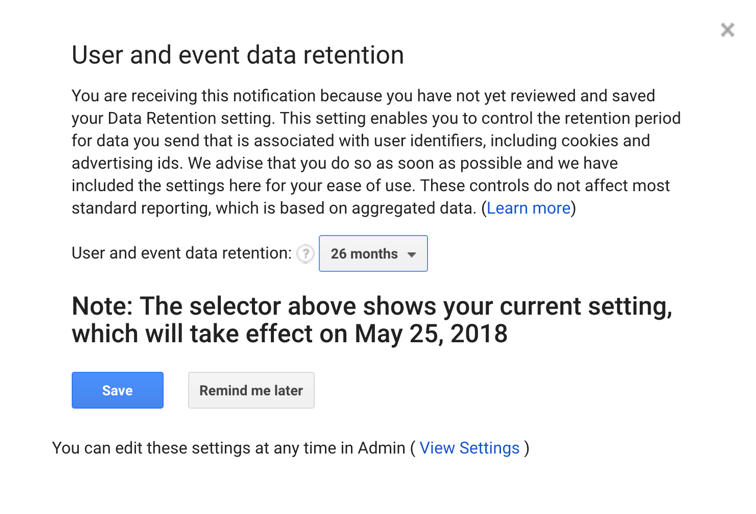 If you’ve logged into Google Analytics in the last few weeks, you may have noticed Google has become more overt with their data retention message. If you’re an account Admin, you’ll see a pop-up message on any properties in which you have yet to select a data retention setting. You can adjust your setting right in the pop-up box. You’ll also see a highlighted message across the top of your admin screen reminding you to select a data retention setting before May 25th. My recommendation on data retention has not changed. If you want to do historical analysis in Google Analytics, you need to select “Do not automatically expire.” Choosing this setting will preserve your ad-hoc reporting capabilities for the lifespan of your account. Also, my position is that you can retain your user data without violating GDPR. Do you want your old data in your Google Analytics account? Just because you can preserve your old data doesn’t mean you should. Right now is an excellent time to go through your Google Analytics account, and remove any data you don’t need. Here’s the method I used to remove old data from my Google Analytics accounts. This a thought process I learned when my agency went through the Entrepreneurial Operating System (EOS). In this process, you write out all the projects you are working to complete. You keep the projects or ideas that have the best chance for success. You kill projects that are impractical or don’t fit your plans. And you combine or merge like ideas together. You can apply this same reasoning to cleaning up your Google Analytics account. Here’s the clean-up I was able to perform using this process. I deleted 14 accounts that were no longer in use. These accounts were dormant. They were collecting dust, and the only traffic in their reports looked like bot traffic. This data served no purpose and had zero future value. There’s no good reason to be a data hoarder. So, I deleted these accounts outright. I moved 20+ dormant properties to the trash can. Inside some of my accounts, I had dormant web properties. Even though I wasn’t analyzing these properties, they were still tracking data. Deleting inactive properties made my accounts easier to work in and manage. Now when I look through my account, I can quickly find the properties that are tracking the data I want to analyze. Here’s an example of property I scheduled for deletion. Adjusting the data retention setting for over 20 web properties sounds time-consuming. But it wasn’t that bad. This task only took about 10 minutes. I was able to use the data retention pop-up to adjust my setting in these properties quickly. I decided to leave a handful of properties with the default data retention setting of 26 months. Not every property needs historical analysis. Ad hoc reporting, segments, table filters, etc. are not mission critical for every business or side-project. If you’re only doing surface-level traffic analysis, you don’t need to keep user data longer the 26 months. I combined several properties into a single account for archiving and ease of access. For years I have tracked multiple side-projects for Jeffalytics in separate accounts. Keeping this data separate from other domains became a pain. So, I took advantage of the ability to move these subdomains into the accounts of their parent domain. Now I can move between the properties that track my parent domain and subdomains quickly. I removed myself from 15 accounts I no longer wish to analyze. These accounts belonged to previous clients. It’s no longer necessary for me to access their data, and I don’t need the liability of having access to their accounts. So, I took the opportunity to remove myself from these accounts. This Google Analytics spring cleaning helped me streamline my accounts. And it allowed me to focus on the specific information I need to see to make better decisions. So far this month we’ve been able to educate over 25,796 blog readers on GDPR and Google Analytics. And our readers have spent nearly 100 hours consuming GDPR-related content on Jeffalytics. I am excited about the opportunity to continue to share my GDPR journey with you. A lot of the information that’s out there about GDPR is overly technical. My goal for our GDPR videos and posts is to make the information we share accessible and actionable. With that in mind, here are some questions you can ask yourself while you’re working on cleaning up your Google Analytics accounts. 1. Is the data you’re collecting necessary? If the answer is “No,” then let it go. Deleting unnecessary data will make it easier to work in your accounts. And you won’t incur the liability of maintaining information that doesn’t serve your research. 2. Could the storage of your data potentially violate GDPR? It makes no sense to store data that could cause a violation. If your data doesn’t contribute to your historical research, don’t keep it. You have a grace period right now to get rid of this data. So you might as well delete what you don’t need. 3. Is your ability to access this data necessary or is it a liability? You don’t need the liability of having access to an account you’re no longer working within. Take this opportunity to remove yourself from these accounts. 4. Does your organization have an explicit data access policy? A data access policy has become even more critical with GDPR going into effect. Every organization should consider putting a data access policy in place. Defining who has access to the user data your tracking, and why those people have access, will also help keep your account management streamlined. 5. Do you need this data for historical analysis? Do an honest assessment of your Google Analytics data storage. Don’t retain user data in properties that you are not using for historical research. You can keep the default data retention settings in place for properties that only need to use the aggregate reports. 6. Is more data better? In most cases, I would say it’s not better to have more data. The internet has been around long enough for us to figure out the type of information we need to track to improve our marketing campaigns. If you’re tracking data you don’t have a plan to use; it’s probably not critical to your business. Instead of collecting more data, focus on your strategies for working with the data that provides the best insights. Removing old data, and refreshing your Google Analytics account is a beautiful feeling. Take my advice, don’t let a bloated Google Analytics account weigh you down. Dump the excess data you don’t need. Do you have plans for a Google Analytics spring cleaning? What actions are you taking to clean up your Analytics account before GDPR? Leave a comment about your plans to remove old data, clean up your account, and prepare for GDPR.